Rooting For History, Not The Red Sox. I love watching the Yankees win. I also love watching sports history made. This puts me in an uncomfortably conflicted position for tonight’s Game 6 in Boston. 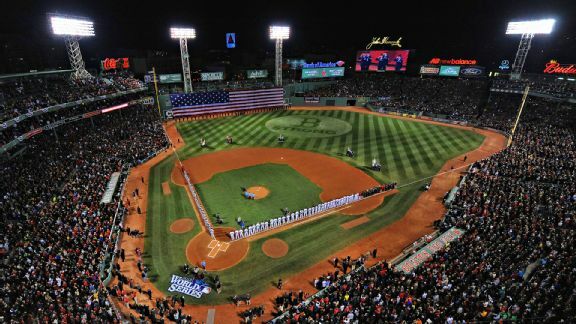 Fenway Park will host Game 6 of the World Series Tonight. There’s nothing more satisfying than a “Wow” moment in sports. I crave those “stop whatever you’re doing and watch this” type of events. Tonight, we potentially get one of them at Fenway Park. With a win, the Red Sox would knock off the St. Louis Cardinals to clinch their first World Series Championship at home since 1918. In 2004, the Curse-breaking barrage of “Idiots” (their term, not mine) capped off their title on the road, in St. Louis. Three years later, they stormed the field as champions again, this time in Denver. The last time they turned the trick at home, Babe Ruth, no doubt, enjoyed a few celebratory cold ones. Needless to say, it’s been a while since Red Sox fans witnessed history made in their own backyard. Root, root, root for the Red Sox tonight? I don’t know if I’ll go that far. But, there’s a chance to witness something that hasn’t happened in 95 years! At 16 minutes past midnight on Friday morning, Aaron Boone added his name to the list. Aaron “Bleepin’” Boone. Tied at 5 in the bottom of the 11th inning of game 7 of the ALCS, Boone sent Tim Wakefield’s first pitch through the Bronx sky, and safely into the hands of George Herman Ruth sitting out in the left field stands. 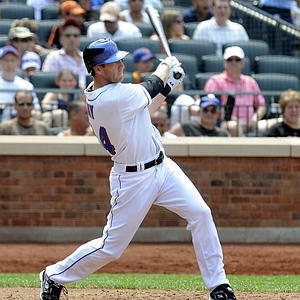 “Like Derek [Jeter] told me, the ghosts will show up eventually,” Boone said. Images From Game 7, 10/16/03. With an early 4-0 deficit, and Roger Clemens out of the game, the 56,297 in attendance were wondering just when the Great Bambino planed on showing up. He probably just got caught up in traffic following the water main break on the Deagon. He showed up 8 innings late to the party, but the Babe arrived in time to see the Yanks capture their 39th American League pennant in dramatic fashion, coming from 3 down in the 8th inning, to win the game 6-5 in 11 innings. Boone’s walk off, series ending blast punctuated the evening. “I knew it was out, I finally put a good swing on it,” he said. It’s a swing that will long be remembered, perhaps one of the most dramatic of all time. One swing of the bat from Boone ended the most compelling, evenly matched series in Major League Baseball history, sending Yankee Stadium into a frenzy and the Red Sox home for the winter. “This is the best, said Yankees manager Joe Torre. “To come here and play against the Red Sox, and play them 26 times and beat our rival like we did, it couldn’t be more satisfying. This has to be the sweetest taste of all for me. However, early on things were rather sour in the Bronx. The Sox got to Clemens early, tagging the Rocket for 6 hits and 4 runs through only 3 innings. Clemens’ ineffectiveness, coupled with Pedro Martinez’s brilliance was a sure sign of a pinstriped apocalypse. 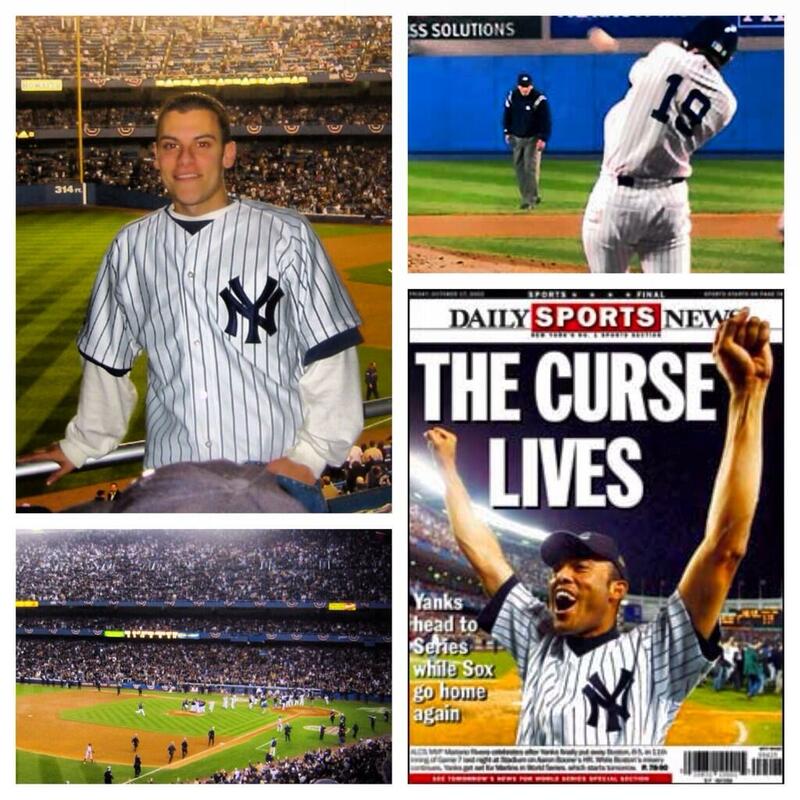 Many wondered if this would be the night the curse was broken. Jason Giambi, batting out of the 7 hole, delivered 2 solo shots and Mike Mussina’s 3 scoreless innings of relief kept the Bombers in the game, but it wasn’t until that fateful 8th inning when the Empire finally struck back. 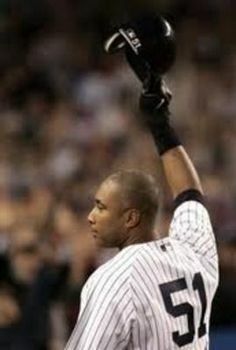 The Captain, Derek Jeter got it all started with a double to right, and Bernie Williams knocked him in with a single to make it 5-3. 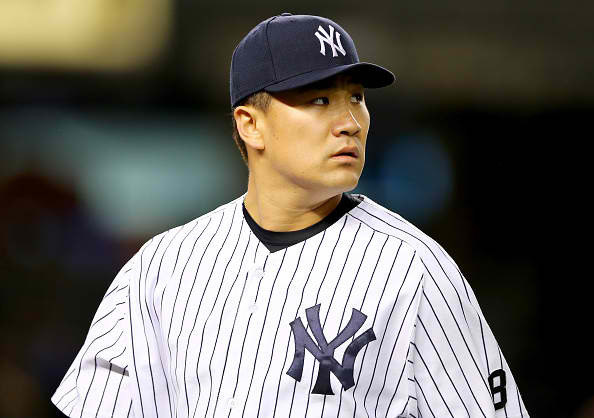 After a Hideki Matsui double, Red Sox Manager Grady Little went out to meet with Martinez. After some convincing, Pedro stayed in the game and gave up a game tying double to Jorge Posada. Red Sox 5, Yankees 5. That’s the way it would stay until the 11th, thanks to a flawless 3 innings of relief from the incomparable Mariano Rivera. It was the first time Rivera had thrown 3 innings in a game since 1996. “Words can’t describe him, he is a cartoon character,” Jason Giambi said of Rivera. After Boone hit, what former Mayor Rudolph Guliani deemed “the best home run since Chris Chambliss in ’76,” the Yankees were World Series bound for the first time since 2001. They will be fishing for Marlin starting Saturday night in the Bronx. That challenge can wait until then. For now, New York revels in its latest dance with destiny. They came from behind to beat Pedro, Wakefield, and an entire Red Sox nation that holds little regard for the aura and mystique found season after season in the Bronx. Those Cowboys from New England may not agree with Jeter, but they surely have heard of the killer “B’s” that continue to haunt them every year. Babe, Bucky, Buckner…and now Boone. No Phone. No Problem. Douds Still Got Through. My iPhone wouldn’t turn on. It wouldn’t charge, connect to a network, or receive a call. A spilled glass of water was the culprit, but all fingers were pointed squarely at me. I was the one who accidently left my device next to cell phone kryptonite. I was frustrated, annoyed, and upset with myself for the gaffe. I felt isolated from the world. All alone. No one could get through to me. In a panic, I put life on hold, and headed to the Apple Store to try and restore my method of communication. Ironically, while there, I ran into a man who once heard me loud and clear. It was 1996. I was a sophomore at Yorktown High School in Westchester, NY, and had serious concerns about what direction I wanted to take my life. Looking back, I guess I was no different than any other sixteen year-old. For some reason, though, figuring out my career path was very important to me at an early age. At times, it consumed me. Professionally, I just wanted to know where I’d fit in. My indecisiveness often left me feeling isolated from the world. All alone. Everyone had advice, but nothing seemed to fit. He was my high school guidance counselor and I craved guidance. We had talked several times in the past – mostly about football, and his father, the first head coach in Pittsburgh Steelers history – but this time we huddled up to discuss my future. With encouragement and compassion, Douds analyzed my situation. Our broad, and lengthy talk concluded with a single, focused plan of attack. We decided I should make a career out of my two passions (sports and writing) and that somehow, I would have to meet a former student of his, Rick Cerrone. Cerrone, also a Yorktown High School graduate, had once engaged in a similar conversation with Douds. Combining his own love of sports and writing, Cerrone went on to become the Director of Media Relations and Publicity for the New York Yankees – a role he held from 1996-2006, spanning 6 World Series appearances and 4 championships. Back then, Cerrone’s schedule was tighter than a Yankees-Red Sox Pennant Race. An actual meeting with him, as Douds had suggested, would be difficult to swing. Getting together with him seemed unimportant at the time though. Just hearing that a local kid had made it in professional sports was enough motivation for me. Yet, just a few hours after Douds told me his story, Cerrone randomly showed up at Yorktown High School. Unannounced and unbeknownst to Douds, he happened to be in the area and decided to visit the man who had once helped him find his own way. Fate? Coincidence? Didn’t matter. I had my meeting. I was fortunate enough to spend some time chatting with Cerrone about his career path, and quickly developed a nice relationship. Through the years, I would periodically pop into the Press Box at Yankee Stadium to meet up with him during games. I made a habit of checking in from time-to-time, to update him on my career, or give him a quick call to say hello. Something I couldn’t do without a phone, though. Several hours had passed now, and I still couldn’t power up my device. Some Genius at the Apple Store informed me that the phone was beyond repair, and I’d have to invest in a new one. The revelation left me even more frustrated, and for the moment, still isolated. In need of a quick pick-me-up, I decided to take a walk before committing to the unexpected purchase. Then came Forrest Douds. Again. 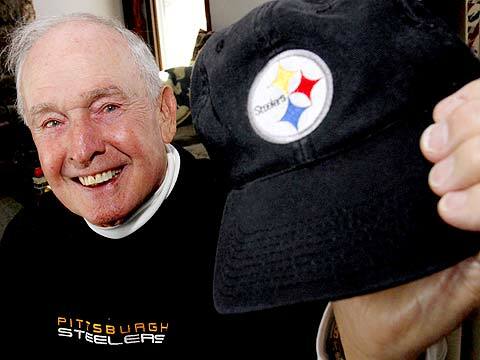 I hadn’t seen him since graduating in 1998, and there he stood, inside Lids, chatting with the kid at the register about his father’s 1933 stint with the Steelers. It was surreal. “Jason Klein…Yorktown High School,” I continued. His eyes opened wider than a 300-pound lineman. What ensued was a true testament to just how dedicated Douds was, and still is, to all of his students. Though fifteen years had passed, it may as well have been fifteen minutes. To my surprise, he remembered everything about me. He jumped right into conversation, asked how my writing career was going, wanted to hear how my parents were doing, and even referenced our fateful meeting with Cerrone. “I tell that story all the time,” he gushed. “So do I,” I admitted. Throughout our talk, Douds showered me with praise and recounted fond memories he had of me as a student. We talked a little football too, naturally. Now a high school football coach, Douds glowingly spoke about his current roster. He loved his players, and loved life. His passion was infectious. For the moment, I realized just how insignificant my dead phone really was. Douds got through to me again. Despite my technological limitations, we exchanged contact info – the old-fashioned way, with a pen and paper – and wished each other continued luck and success moving forward. Before heading back to the Apple Store, I asked that he stay in touch with me. With a new iPhone in my pocket, he’d have no trouble getting through to me. Derek Jeter doesn’t want to talk about himself. Heck, he doesn’t even want to hear someone else talk about him. 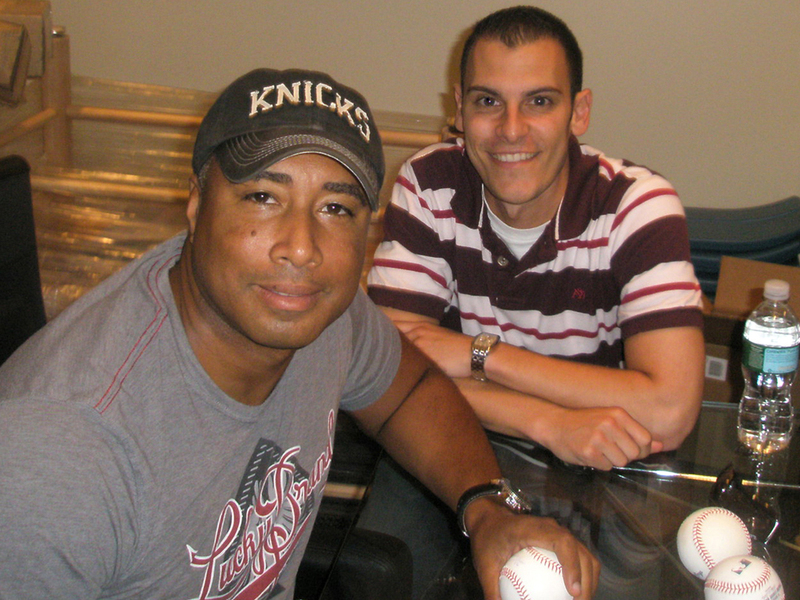 I met with Jeter on Tuesday afternoon, at his place of business, Yankee Stadium. A group of fifty children had just finished up an on-field clinic, coordinated by Steiner Sports Marketing, and had since gathered out in the centerfield bleachers. 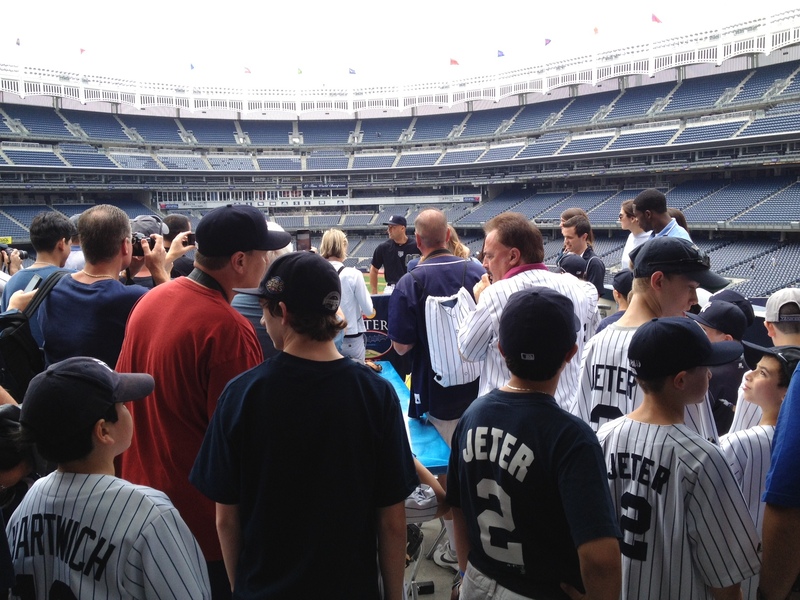 Sitting along with their parents, they anxiously awaited their chance to chat with the Captain of the Yankees. Jeter Was Humble During Our Talk. I was there to emcee the question and answer session – a staple of most Steiner Sports events – and decided to give Jeter the type of introduction an athlete of his stature rightfully deserves. I was prepared to mention his Rookie of the Year Award, all of the Gold Gloves, the All-Star appearances, “The Flip,” “The Dive,” the fist pumps, his 3,000 hits, and of course, his 5 World Series Rings. It was the proper thing to do, no question. “I have the pleasure of introducing someone who really doesn’t need an introduction…” I started. “So don’t introduce me…hi everyone!” interrupted Jeter. Derek Jeter cut me off like an errant throw from the outfield. I quickly recovered. “I’ll do it anyway,” I said. “No, no, no, you don’t have to do all that,” Jeter interjected again. This time, defiantly waiving his arms above his head. “Hi, I’m Derek.” He said. He’s just Derek. Simple as that. The Kalamazoo Kid has never been one to hog the spotlight, or discuss his personal achievements. It’s just not his style. 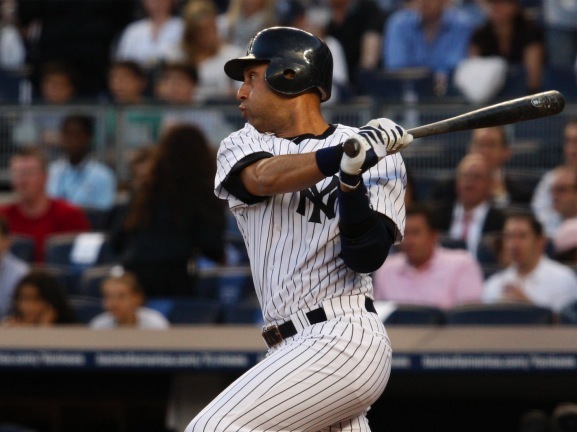 Throughout his legendary career, Derek Jeter has maintained a very consistent message. His priorities are his teammates, and his mission statement is to win championships. Period. It’s a theme that permeated our chat. Jeter was asked to decipher which of his seventeen seasons he cherished most. His answer was confident, and decisive, like his swing. Many of the little sluggers listening in weren’t born when confetti rained down on those teams from the late nineties. I asked Jeter to explain to them what made those World Series teams so special. His response reinforced his selfless stance. Jeter Larger Than Life With Fans. I couldn’t break him. His team-oriented responses are polished, professional, and genuine. He consistently looks you in the eye with every noble word he speaks. Jeter was unflappable throughout the session, hitting all of his points with the same consistency he does a baseball. The reply gave insight into his tremendous composure and focus on the field. There is no one in the game more positive than Jeter. Always confident and smiling, Jeter tries to avoid all negativity, a trait that will ultimately keep him out of the broadcast booth once his Hall of Fame career comes to an end. He also knows a lot about success. He’s had a ton of it over the course of his seventeen seasons with the Yankees. You could ask him about all of his triumphs. Chances are, he won’t elaborate too much. You see, Derek Jeter doesn’t want to talk about himself. In his eyes, he’s no bigger than anyone else on the team. Bald Vinny comes to play every night. A staple within the hallowed walls of Yankee Stadium, like pinstripes and Sinatra, “Bald” Vinny Milano can be seen, and definitely heard, sitting in section 203 during every home game in the Bronx. It’s obvious that Milano is a passionate and dedicated Yankees fan. 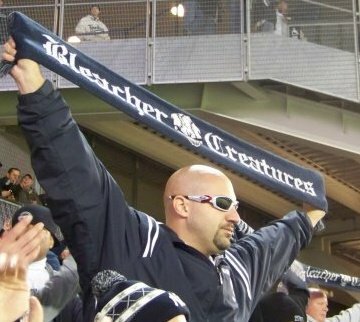 He is also the most prominent member of the Yankee Stadium Bleacher Creatures. With his cult-like following comes a unique responsibility. Prior to the first pitch of every home game, Milano rallies the rest of the creatures to their feet, and works them into a pinstriped frenzy. As the first pitch crosses home plate, Milano gazes into centerfield, through his signature Oakley sunglasses, cups his hands around his mouth, and goes to work. The Roll Call is underway. Starting with the Centerfielder – Curtis Granderson has the honor in 2011 – Milano and the rest of the Creatures work their way around the Yankees defense, chanting the player’s name until they receive acknowledgement (typically a waive) from the player. A tradition in the Bronx since 1997, the Roll Call only takes place during home games. According to Milano, “it disrespects the other team” if done on the road. It’s also extremely difficult to rally enough troops to be heard while in enemy territory – not something the Creatures struggle with on East 161st Street and River Avenue. According to Milano, the Bleacher Creatures are a different breed of fan. They believe their proactive approach to cheering benefits the Yankees on the field. With the Bronx Bombers in contention for a World Series almost every year, it’s difficult to argue with the results. However, for Milano, it’s not just about peanuts and Cracker Jack at the old ballgame. Attending every single home game as a fan is a time-consuming task in itself – he’s missed only 7 games since 2004. For Milano, it’s also his livelihood. He often gets the question, “how do I become a Bleacher Creature?” According to Milano, there are only three simple rules to follow. First, a fan must willingly choose to sit in the bleachers. An everlasting passion for the Yankees is the second requirement. Finally, complete dedication is necessary. Milano is quick to point out that it’s easy to sit in the bleachers for a few games each year and claim to be one of them. That just won’t cut it. “[Bleacher Creatures] attend 40-50 home games a year,” says Milano. “It’s about being there in person and supporting your team, day in and day out. Perhaps no one was as consistently devoted to supporting the Yankees as Freddy Schuman, the legendary super fan, better known as “Freddy Sez.” Schuman would walk around Yankee Stadium each night with a frying pan, urging fans to hit it with a spoon for luck. Schuman passed away in October 2010, during yet another Yankees postseason run, perhaps leaving Milano as the “next generation” face of the Yankees fan. Rather than compare himself to someone like Schuman, Milano remains humble, just happy to be associated with a great group of fans, and the premier franchise in professional sports. He gets to do just that, when he shows up to play, every night. Deep in the heart of the ever-changing sports landscape, the Steiner Sports Corporate Office can get chaotic from time-to-time. On Saturday, December 4, it will be a complete Zoo! That’s when members of the 1977 and 1978 World Champion New York Yankees, affectionately referred to as the “Bronx Zoo,” will be making their way up to New Rochelle, NY to meet and greet fans at Steiner Sports. Touting some of the biggest and boldest personalities ever to sport the pinstripes, this group of players draws a crowd wherever they go, holding a special place in the hearts of Yankees fans everywhere. 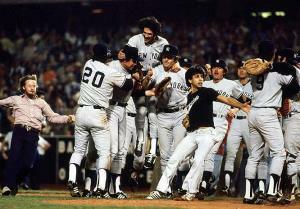 The 1978 Yankees Celebrate their WS Title. Rightfully so. This distinctive collection of Bombers captured imaginations in the late 1970’s, winning back-to-back Titles, the first Championships of the George Steinbrenner era. While their World Series rings secured their place in baseball history, it was, perhaps, their colorful personalities that created lasting power with their fans, even inspiring a 2007 ESPN Drama, The Bronx is Burning. There is no doubt, fans in attendance on December 4th will be treated to a wide-range of behind-the-scenes stories, as told by the men who lived them during the summers of 1977 and 1978. Among those in attendance at Steiner Sports will be Ron Guidry, Sparky Lyle, Chris Chambliss, Bucky Dent, Graig Nettles, Paul Blair, Roy White, Willie Randolph and Lou Piniella. 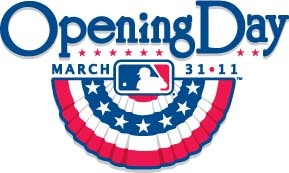 The event will be catered, Yankee Stadium-style, including the World Famous Lobel’s Steak, peanuts & Cracker Jack. Fans can take photos with the players, participate in question & answer sessions, raffles, giveaways, and a silent auction. In addition, special activities will be set up for children. Those in attendance will get the unique opportunity to re-live historic moments like Reggie Jackson’s 3 home run performance in Game 6 of the 1977 World Series and Bucky Dent’s curse-preserving blast at Fenway Park during the one-game playoff in 1978. It’s just the latest meet & greet event offered by Steiner Sports, the leader in authentic sports gifts and collectibles. With so many great Yankees on-hand, this particular event figures to take on a Zoo-like atmosphere…minus the giraffes and elephants, of course.